Abstract: The growth in container volumes over the last decades means an increase in container handling at terminals around the world. Besides the economic benefits, the container handling also causes additional pressure on the surrounding infrastructure and the environment. Precisely at a time when environmental issues, in particular the CO2 emissions, are the main concern of the energy and climate change debate. Although not specialized in the field of energy consumption, many policy makers and managers need to make decisions about CO2 emission reductions. This paper provides a six -step approach to make the energy consumption (and hence CO2 emissions) easily transparent. The approach is illustrated for the energy consumption of yard lighting. It can be concluded that our first attempts to understand the energy consumption of yard lightning give promising results and can contribute to an improved benchmark of the standard CEN EN 16258. Reference: J.H.R. van Duin, H. Geerlings, J. Froese, R.R. Negenborn. 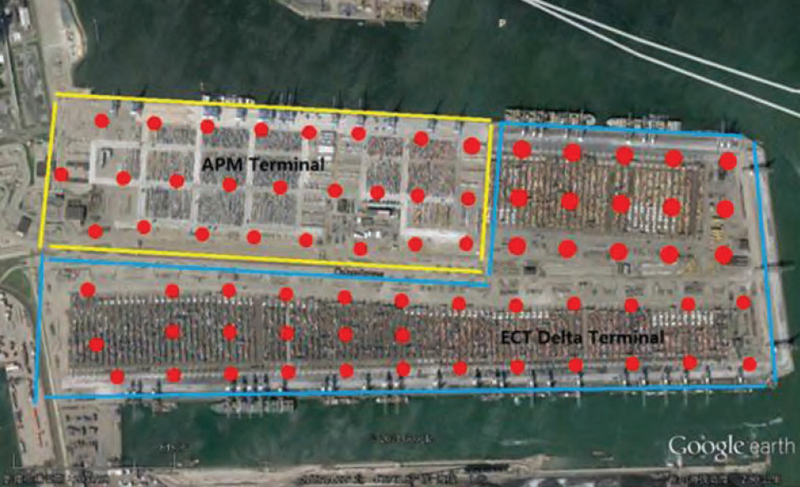 Towards a benchmarking method of energy consumption at terminals. International Journal of Transport Development and Integration, vol. 1, no. 2, pp. 212-224, 2017.